Connecting satellite terminals and PA amplifiers. The new FIO4 is the answer. Connecting satellite terminals like Sailor Fleet Broadband or Sailor Iridium can now be done via our new FIO4 trunk line card. 4 trunk lines, 2 audio I/O, 10 relays and 2 digital input. 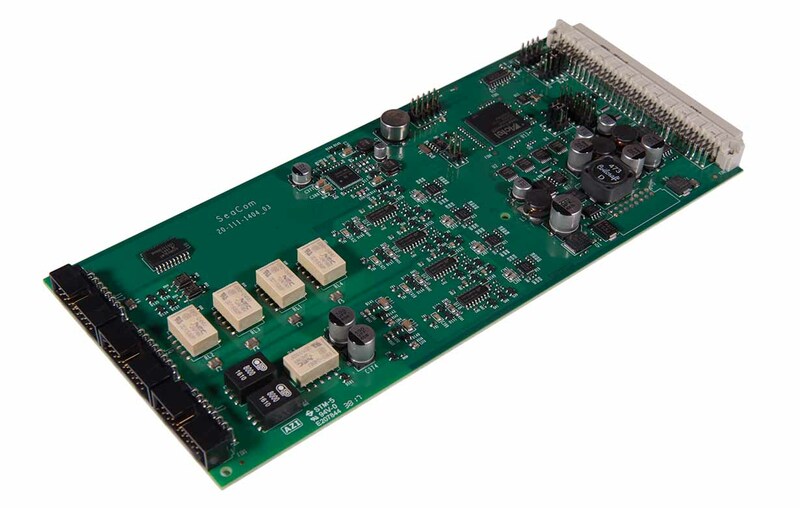 The FIO4 is a real general purpose Flexible I/O card for the SeaCom systems, with the many channels packed on one single card. The card is on stock for sale now. We have 4 trunk lines on this single card. The 2 wire analogue lines connects directly to by far the most of satellite terminals having FAX or PABX interfaces. Look for the RJ11 connector. The SeaCom system is prepared for beeing interfaced to external PA systems or amplifiers. The new FIO4 card gives 2 such interfaces with 600 ohm 0dbm level and galvanic isolation. And there is a relay contact activated on PA calls or direct calls to the channel. The relay can be used to turn on the external amplifiers. The Audio I/O can also be used for inputting any source of sound or voice. Music or VHF radios for example. By dialling from a telephone, loistening to music or listening to a VHF radio can be started. As a new thing, the FIO4 card has two general purpose relays. These relays can be activated on PA calls, on ringing also in a group, and they can be set on/off or toggled by keypress from a telephone. These relays can be used for opening doors, starting light or fans etc. The relays can be activated when called, but the relay state can be preserved when disconnecting, so things can be started or stopped for longer that the telephone call. 8 zone relay drives are provided. These are used with the ZRU relay unit. The 8 relays can be used to implement zones by switching speakers on a 100V PA speaker line. The zone relays are typically programmed to participate in a PA group, and by this will connect the desired speakers when the group is called.